Oden Technologies, the Industrial IoT startup that provides manufacturing data analytics, has closed $10 million in Series A funding. The round is led by European venture capital firm Atomico, which appears to be revving up its “Industry 4.0” investment strategy following a recent investment in CloudNC. A number of existing investors also participated including EQT Ventures, and Inbox Capital. Noteworthy, Atomico founder and CEO Niklas Zennström, who also co-founded Skype, has joined the Oden Technologies board. Originally founded in London but now based in New York, Oden Technologies pitches itself as an Industry 4.0 company that has built its own industrial IoT hardware and “big data architecture” to offer a platform for manufacturers of any size to analyse and optimise factory production via the cloud. Put simply, the Oden device plugs into almost any kind of manufacturing machine, while its “software adaptors” integrate data from existing enterprise resource planning (ERP) systems and quality control software on the manufacturing line. 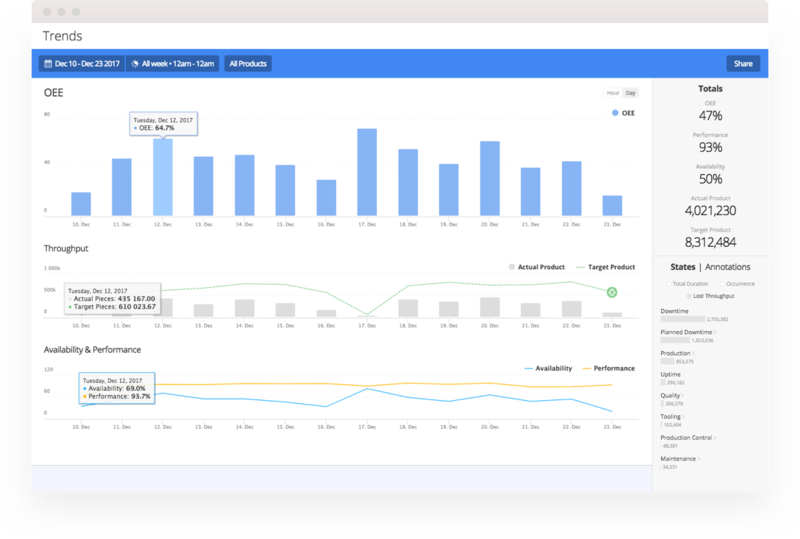 This data is then uploaded to Oden’s cloud analytics platform in real-time to give manufacturers the full production picture, including real-time factory floor monitoring. So, why is this significant? Essentially, the retrofittable Oden device and resulting data analytics makes the existing factory floor smarter. This includes the ability to spot manufacturing defects or aspects of a machine’s degrading performance that could lead to defects, and more broadly, ways to further optimise production throughput and uptime. The result is a reduction in waste (think: products that need be discarded or are ultimately returned by customers), and an increase in efficiency more generally, helping tech-driven factories retain their competitive edge. In a call with Oden Technologies co-founder and CEO Willem Sundblad, he said that the company’s mission is to help manufacturers achieve “perfect production,” in terms of not only making better products but also making them faster, cheaper and with much less waste. Traditionally manufacturers haven’t had access to the right data and insights to make factories more efficient and productive. However, with the collision of big data, cloud services and new industrial IoT hardware, this is quickly changing and is the exact space that Oden operates in. In terms of what data Oden’s device captures, Sundblad explained that it typically consists of metrics that relate to machine process, health, the processing of the part/product, and quality. “The raw data is mostly available in the machines but then we analyse it to provide answers,” he says. In addition, Oden captures things like the melt pressure of the material, the temperature profile when the material melted, dimensional read outs to understand the quality of the product, and water temperatures from cooling tanks. Other data points include revolutions per minute on moving parts inside of a machine, the motor load of the motors, and the speed of production, to name just a few. “We analyze and process that data so customers understand how much excess material they are putting on the product, was the quality Ok, and if not why, alerting for when things are bad or will be bad, and [doing] trends analysis for how the product can be optimised. It all comes back to ROI for customers, which always comes from more uptime, less scrap and more good quality output”. Atomico’s Zennström echoes these sentiments, arguing that manufacturing has until now remained “relatively untouched” by digital technology. As a result, it still has major areas of inefficiency. “The combination of IIoT, Big Data analytics, cloud computing and machine learning marks a new era for industry,” he says. This will see Industry 4.0 technologies not only increase efficiency and reduce waste, but also enable smaller batch sizes, more personalised products and greater product innovation. Meanwhile, Oden says it will use the new funding to further expand its R&D and engineering teams in New York, and to accelerate customer growth with new sales teams in the manufacturing hubs of Illinois, Ohio and Texas. The company also recently hired Deepak Turaga, Adjunct Associate Professor at Columbia University, as its VP of Data Science. He’ll be helping Oden with its machine learning and AI efforts, and has previously worked at IBM as the Distinguished Research Staff Member and Manager of the AI First ML and Planning Group.